This is not the time to be a shrinking violet or a shrivelling sunflower. It's the time to be bold. To stick out. To impress, To persuade. It’s never been easier to brand large outdoor spaces. Making the most of your courtyard, car park, forecourt or pavement? Our display range just got bigger and there’s some utterly huge new things. 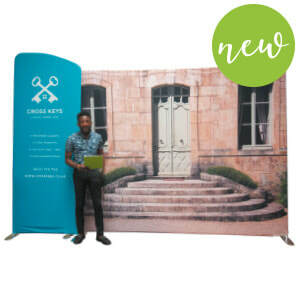 Be ready for expo season, with our new range of affordable exhibition items. It’s summer, let’s Be Bold. 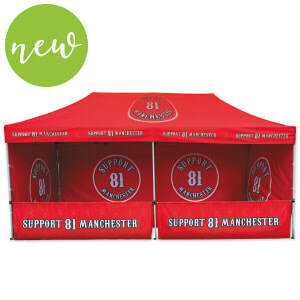 Our personalised parasols now come in two larger sizes – Large 2.4m square and Super 3 x 4m square with cantilever. Give your stand some height with a scallop-shaped stand, complete with connection kit, TV bracket and two shelves. New 6m wide gazebo, shown with two full height (single sided) back walls, two full height (single sided) side walls and two (single sided) front half height walls. Fin-shaped fabric stand can be used on its own or attached next to a larger straight backdrop such as our Stage 30 fabric stand. 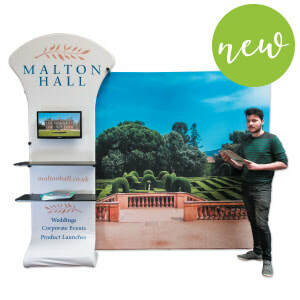 Our new range of personalised point-of-sale is great for retail displays and exhibitions. Order as little as one copy. Each is supplied flat, ready to be assembled (no tools required).